The Jordanian team rests in the shade of a sandstone cliff before the "urban assault" event at the Warrior Competition on April 21, 2015. In this event, soldiers must rush over a dirt verge, storm a building in a mock city, rescue a hostage and fire at targets in the distance. The Palestinian team is photographed during the opening ceremonies of the seventh annual Warrior Competition on April 19, 2015 at the King Abdullah II Special Operations Training Center near Amman, Jordan. The Lebanese Armed Forces gather their gear before heading to the next event in the Warrior Competition on April 20, 2015. The competition is held at the King Abdullah II Special Operations Training Center near Amman, Jordan. The Jordanian team prepares for the first event of the Warrior Competition, "Top Gun," in which soldiers must shoot at targets at varying distances with three different weapons, while being judged for speed and accuracy. Jordan and the U.S. were finalists, with Jordan ultimately coming in first place. The Colombia team participates in the desert stress shoot event in the seventh annual Warrior Competition at the King Abdullah II Special Operations Training Center near Amman, Jordan, on April 21, 2015. 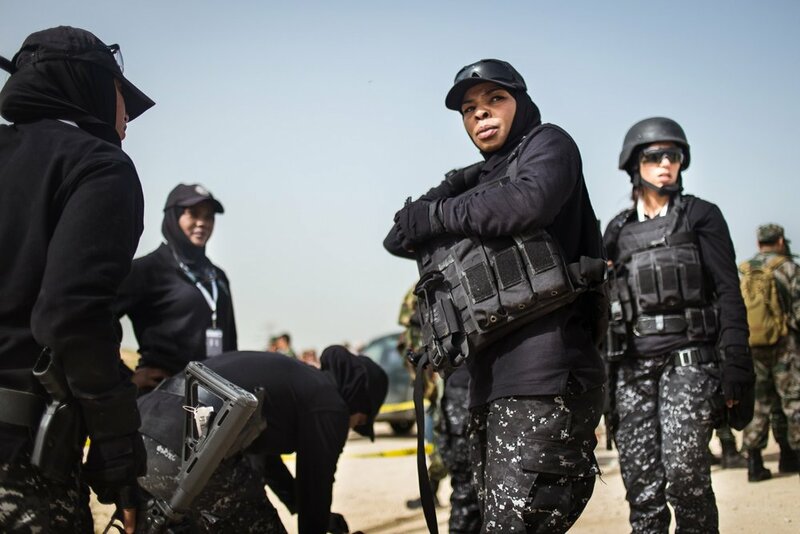 The all-women's Unit 30 SWAT Police team from Jordan competes in the three-gun gauntlet during the seventh annual Warrior Competition at the King Abdullah II Special Operations Training Center near Amman, Jordan, on April 20, 2015. Soldiers wait for instructions atop a tower during the "Urban Assault" event on April 20, 2015, during the seventh annual Warrior Competition near Amman, Jordan. The center, which spans 25 acres of a blasted-out desert canyon, is a state-of-the-art training facility complete with mock cityscapes, villages, and grounded aircraft. The exercises are all performed with live ammunition. 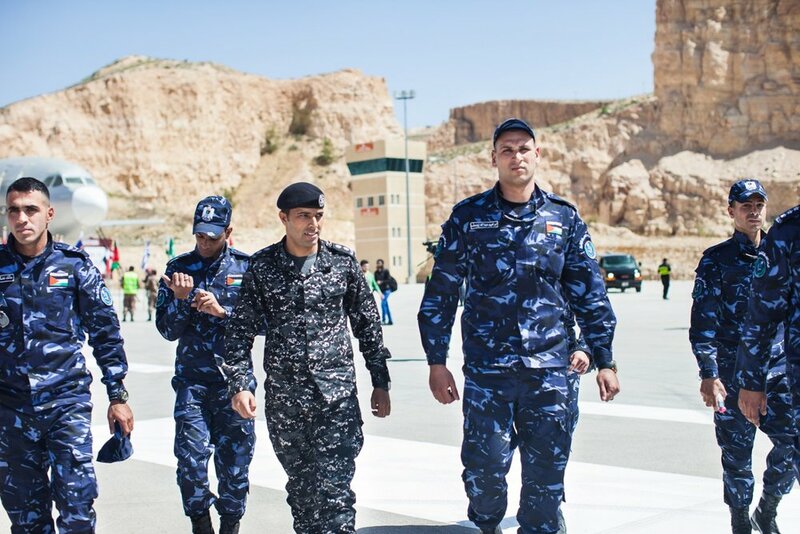 The Jordan team participates in the Airbus seizure event, demonstrating how to execute a target onboard a passenger aircraft. 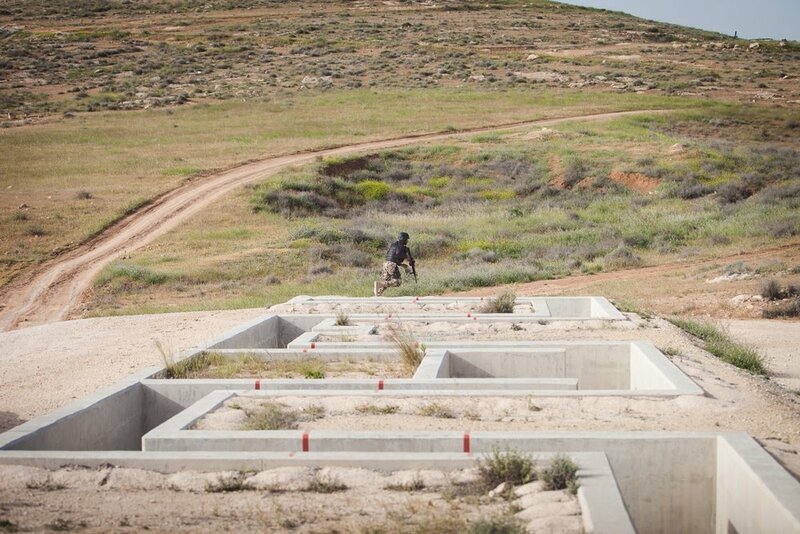 The exercise was part of the seventh annual Warrior Competition at the King Abdullah II Special Operations Training Center near Amman, Jordan, on April 21, 2015. 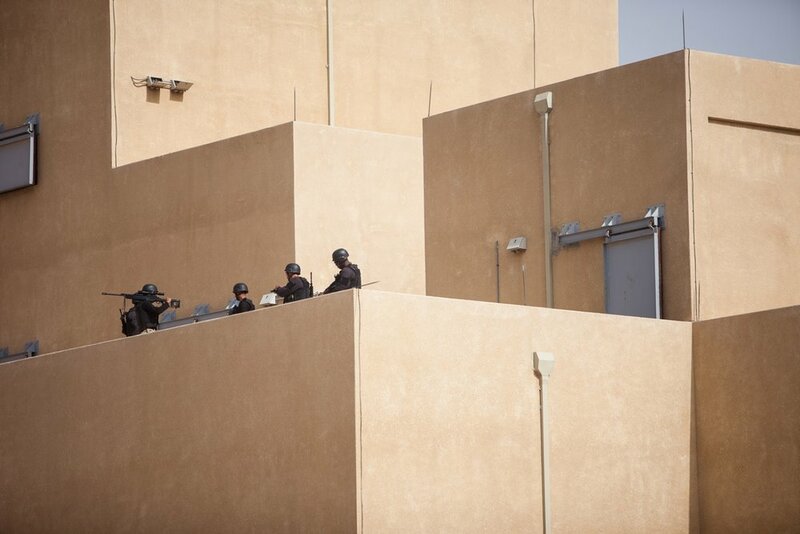 The Jordan team participates in the hostage rescue exercise at the seventh annual Warrior Competition at the King Abdullah II Special Operations Training Center near Amman, Jordan, on April 20, 2015. 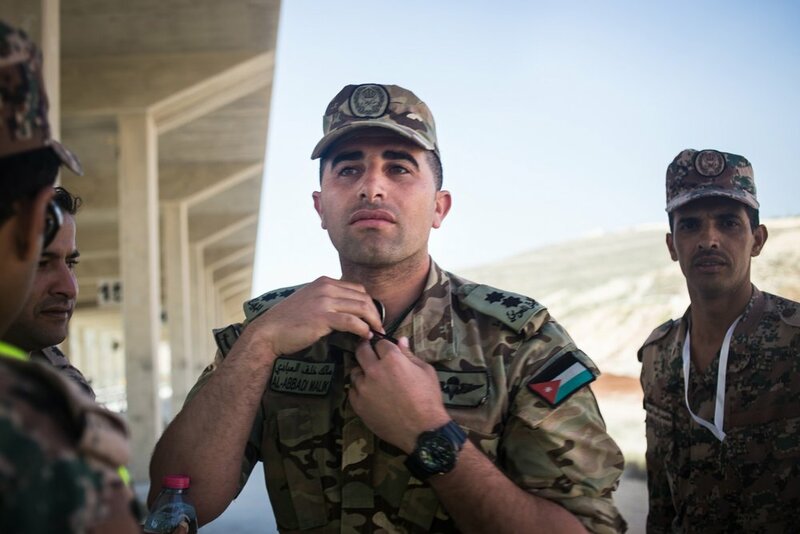 Commander Malik Al-Abbadi, leader of the Jordanian team, is photographed during the desert stress shoot at the seventh annual Warrior Competition at the King Abdullah II Special Operations Training Center near Amman, Jordan, on April 21, 2015. Teams from various countries relax together and cheer on their teammates during the first event of the Warrior Competition, "Top Gun." Elite counter-terrorism teams from around the world compete for the title of champion at the King Abdullah II Special Operations Training Center near Amman, Jordan. Members of the American and Canadian teams cheer together and watch the remaining teams compete in the "Top Gun" event at the seventh annual Warrior Competition at the King Abdullah II Special Operations Training Center near Amman, Jordan on April 19, 2015. Jordan and the United States were finalists in the event, with Jordan ultimately coming in first place. The reverberation from the desert canyon walls makes it difficult to tell where the sound originates ‐ but then, there is the harsh crack from the sniper’s rifle, soldiers sprint through city streets to storm a building, and a human‐sized form is hauled out and loaded onto a truck. Lieutenants shout in Arabic, Russian and English. This isn’t a real war, but the scenes being played out could mimic a not‐so‐distant urban battlefield. This is a staged scenario in a mock cityscape, part of the seventh annual Warrior Competition held at the King Abdullah II Special Operations Training Center (KASOTC) on the outskirts of Jordan’s capital, Amman. 38 teams from 18 countries participated this year. Jordan’s day of reckoning came this February when a video showing the death of Jordanian pilot Muath al-Kasasbeh was released by ISIS. The monarchy has since used the pilot's death to galvanize public support for airstrikes in Iraq and Syria. “Jordanians from all walks of life showed the world that Jordanians are united after the great sacrifice of our hero," said Major General Hani Manaser. With bloody civil wars on two frontiers, Jordan is keen on developing counter‐insurgency capabilities. KASOTC, operated by the Jordanian government and a military contractor based in Maryland, was built with an initial $90 million from the U.S. government. Training at KASOTC can cost up to $250,000 per week. In 2014 alone, the U.S. provided $660 million in aid to Jordan, which has now increased to $1 billion per year. As special forces teams undertake missions that can decisively determine the outcome of prolonged conflict ‐ or in the case of police, in quelling civil unrest ‐ demand is likely to only increase.